Ancestors. Genealogies. Roots. We all have them. Some of us can trace them back for centuries and others of us are lucky to have information on three or four generations preceding ours. Whatever our time frame, we find our personal history interesting, don’t we? We look at photos of family members who were long gone by the time we entered the world, and we see resemblances to ourselves, our parents, or our grandparents. We hear stories about the generations gone before, and we take note of jobs or interests that are similar to those in our family today. We become aware of our roots and feel a bond. Recently I discovered my writing roots. Thanks to Mom and Dad’s recent move and the packing that preceded it, reminders of other writers before me in our family came to light. Reminders in the form of diaries. I’d say writing is in my blood. Seeds for my desire to write were planted years ago by grandparents on each side of my family. Not only did they plant the seeds with their faithful recording of the daily weather and happenings on their farms and in the lives of our family, but I like to think they passed down an aptitude for writing as well. I’m just the one who has finally let those seeds take root and grow. My writing roots are just one aspect of the total root system of my life. I also have Irish and Scottish roots, farming roots, homemaking roots, musical roots, and spiritual roots—and the list goes on. I’m especially grateful for the blessing of the Christian heritage in our family that lives on now in our lives and the lives of our children. Let’s all take a few minutes to consider our root systems and say a prayer of thanks for all those who have come before. And then let’s consider what seeds we are planting today. What kind of roots will future generations be able to lay claim to because of us? What kind of inheritance do you hope to leave for your children and grandchildren? 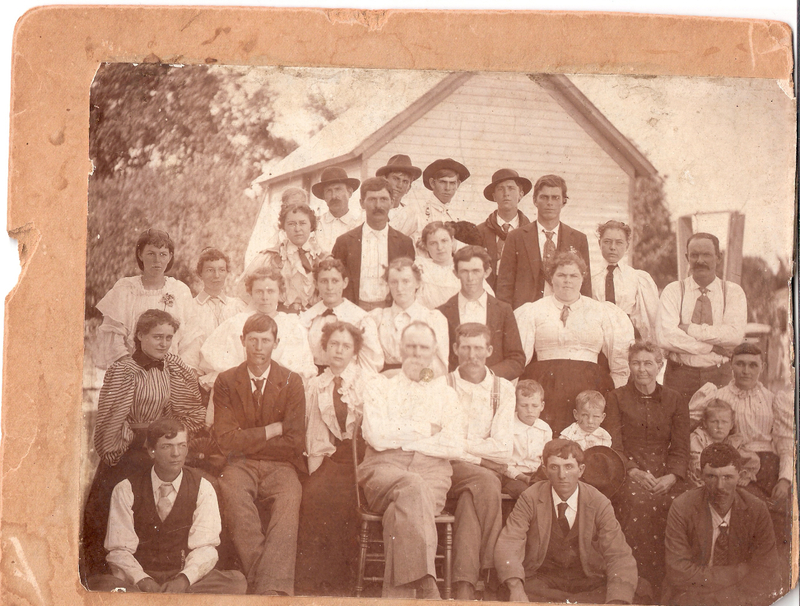 *The photo above is of my great-great Grandpa Hoy and family, possibly taken in 1896. He is seated in the center (has a gray beard and wearing a white shirt). He came from Ireland around 1854, stowing away on a ship with his brother when he was sixteen years old. They got separated in New York City after arriving. They never saw one another again. Cheryl, what a neat thing to find that the seeds of writing were passed down to you. It validates us to learn things like that. . .
A few years ago I learned that my great-grandmother used to knit and read at the same time! Wow! I do that too. That is so so sad that your ancestor never saw his brother again! You would think the community would be small enough to be able to find each other again, even in NY. Jana, so neat about how you found you have something in common with your great-grandmother. Bet you would love to sit and knit with her now. Jennie, thanks for visiting my blog! And yes, I can’t imagine how sad and scary it must have been for a 16 yr old to lose track of his only family member in a new country. I’m sure New York City was huge even then, though. O wow how awesome that you have those diaries. That is so cool to be able to read what went on in their lives first hand. How wonderful for your family that you are keeping journals as well. Love that picture, CHERYL! I think mid-1800’s is when we think my great-great-grandfather came over from Ireland but I think he was Scots-Irish. I am also not convinced that he wasn’t here earlier. Just a suspicion I have from research I did. Have a blessed day! Alicia, yes, I’ve thought about how neat it will be for my kids and grandkids to one day have the journals I’ve been keeping. Journals are keepsakes that all of us can pass down if we’ll just do it, huh? Carrie, thanks so much for visiting my blog — so nice to have you here! I love old pictures, too. Family history is so interesting, isn’t it? I occasionally consider all of the people through the years that contributed their DNA to me. Amazing isn’t it? I enjoyed your post! I have a keen interest in my ancestry. I’ve done a lot of work on it, which is a part of the reason we just visited Scotland & Ireland. Who knows, you & I may have common roots?!! As for me, I want to leave a trail I’d be proud to have my children follow as a heritage. Kim, thanks so much for visiting my blog — so glad you enjoyed the post! Kathleen, wouldn’t that be something if we had some sort of common roots there in Ireland or Scotland! How lovely to know that writing is in your blood, the love of the written word passed down from generation to generation. I love old family stories, genealogy and immigrant tales, so I really liked this post. The tragedy of your great-great-grandpa Hoy’s separation from his brother in New York brings a tear to my eye. I can’t even imagine such loss, but then he embraced America, determined to be a success in a new land. Mairead, I’m so glad you enjoyed the post. Yes, I can’t imagine what that must have been like for my great-great Grandpa Hoy. Would love to know even more of the story. We’ll find out in heaven one day, though! Debbie, I need to take time to look at the diaries I have more closely, too. I’ve just looked at certain dates so far. As much as you probably don’t like being laid up, at least you’re getting to catch up on some sitting-down things. I think your photo albums will be a wonderful legacy!